Having already blown up several confectionary items we decided it would be a good move to destroy a savoury item too. After a lot of serious deliberation we chose Hula Hoops as the target snack since we felt it would be more ballistic than potato crisps. No messing about here.... The bag is carefully opened at the base and a small jiffy bag containing flash powder and a detonator (electric match) is inserted. 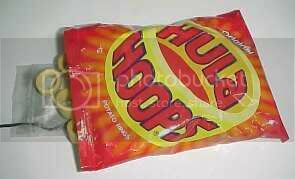 I also take the opportunity to scoff several of the Hula Hoops, since unfortunately this was the last bag and the experiment had put me in the mood for some. The bag is sealed with Gaffa tape, stood upright and wired to the remote firing system. 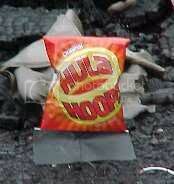 With a loud bang the bag disappears and Hula Hoops explode into the air. 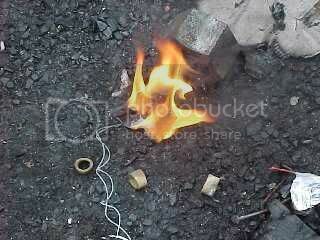 The blazing remains of the Gaffa tape, since the metallised plastic bag appears to have been shredded in the blast. 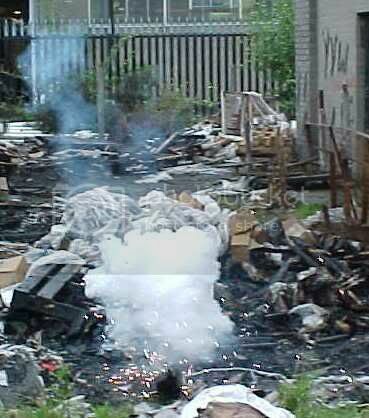 The charred Hula Hoops were actually picked up from around the vicinity of the explosion and put next to the blazing remains of the rig for effect, since there were none directly in the vicinity of the taste explosion.